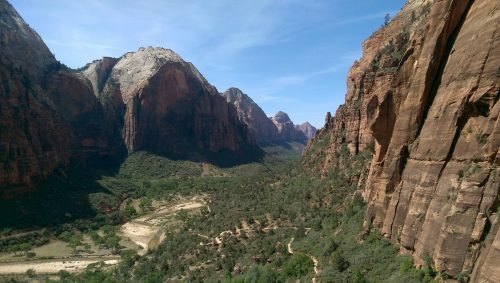 Zion National Park is the third post in my “The American West” series about a National Park-themed camping road trip I took in early summer, 2015. 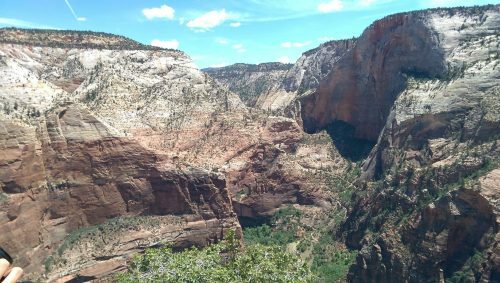 The religious connotations of the name, “Zion National Park”, are quite fitting. This, just behind Yosemite, is the park I was most excited to visit. A good friend of mine had visited a few times and constantly raved about it when the topic came up at parties. 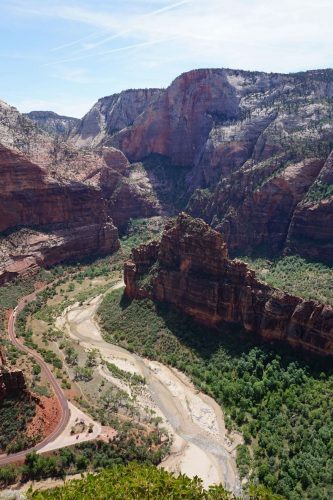 Two million years and the Virgin River carved the land to create one of the most picturesque sites in the world. What better place to relax and calm your mind for a little while? The river is surrounded on either side by lush forest bounded by colorful, sheer, weaving canyon walls. 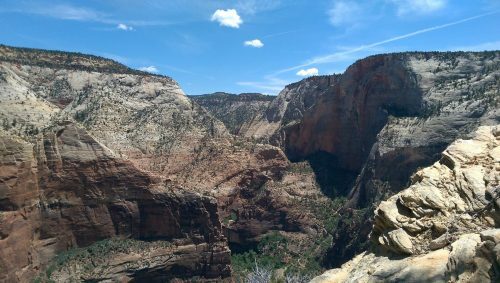 A number of sites with varying levels of accessibility offer literally awesome views of the canyon. 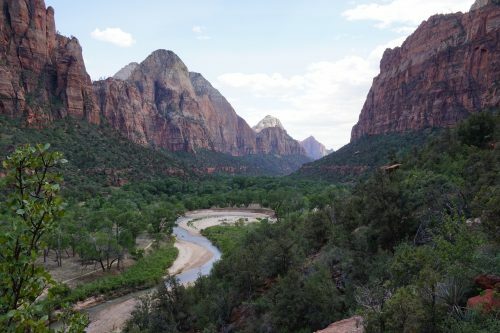 Throughout Zion National Park, propane-powered shuttles run up and down the canyon road ferrying visitors to the few major lodges, sights, and trailheads within. The main visitor’s center offered great informative displays about the best ways of seeing the park based on your allotment of time: less than & more than three hours, all day). We, however, had already decided on our route. 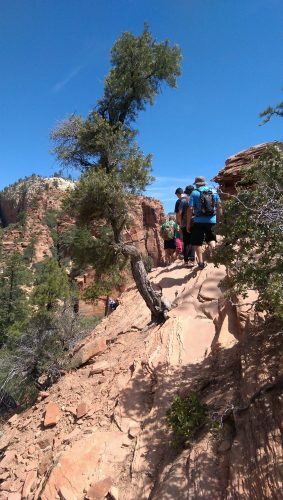 Our choice, as with many other visitors, was to shuttle to an area called “The Grotto” and hike to Angels Landing, one of the most popular hikes at Zion National Park. The route was arduous, rocky, scorching, and crowded…but damn was it worth it. Luckily, we’re both confident on our feet, okay with heights, and fit enough to make it without any issues. 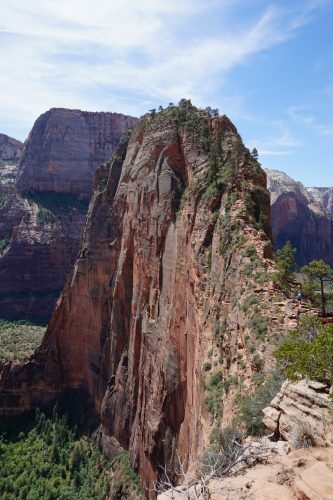 Many hikers along the way get very shaken by the height and sheerness of the drops off the sides of the trail. People stop often to give their hearts or legs a small reprieve. It’s a good idea to rest if you’re tired, too. 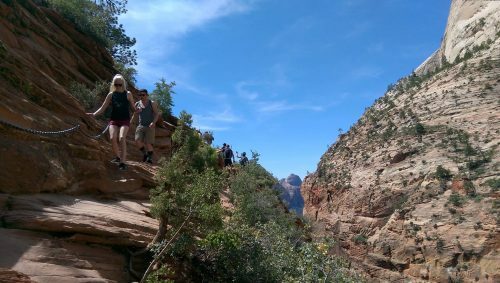 Six people have died since 2004 while hiking to Angels Landing. It’s not the most dangerous or toughest hike in the world, but the danger still has to be respected. The drops are immediate and directly adjacent to the path in some areas. Additionally, the trail is only wide enough for one person at a time for most of the last third of the trail by time. Don’t do anything stupid and always be sure of your footing, and you’ll be okay. yuuuuup. 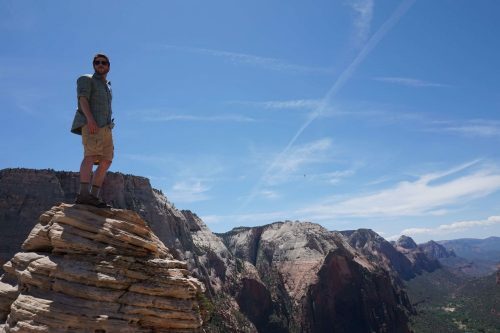 That’s me up there, precariously standing atop a rock, on top of Angel’s Landing. I LOVE this photo. 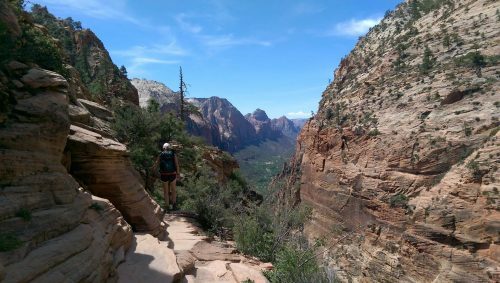 The first two-thirds of the trail are paved switchbacks, punnily named “Walter’s Wiggles” after a man who helped design the park in the 1920s, followed by a trail through a narrow canyon of a tributary to the Virgin River. After that beautiful and trying hike, you do reach a landing… but one which does not have any angels. The landing does have treacherous toilets, but other than that it just serves as a nice stop before the next and hardest part of the climb. The last third, as I mentioned before, is mostly one-way climbs over rock formations, sometimes aided by a chain railing on one aside. This part is not for the faint of heart. In the easier parts, we happily skipped across the rocks as mountain goats would, but some people clung tightly to the sides and to the chain with white knuckles. It is not something my mother would do, with the utmost respect. To me, the hike was exhilarating with every step upward, seemingly directly into the sky. 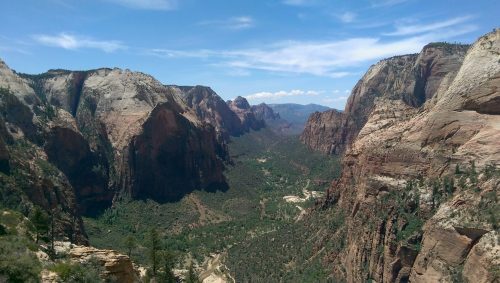 After a couple of fake-out landings, several twists, many turns, and a few thousand hip-stretching steps, we reached the peak, Angels Landing. 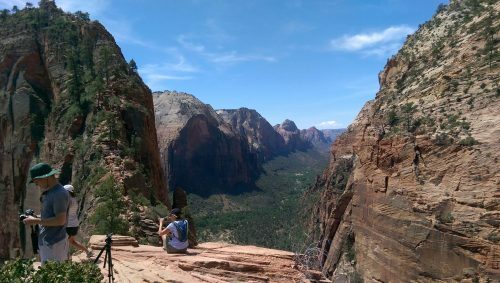 This view would be worth making a trip directly from Chicago to Zion National Park for. Three-hundred-and-sixty degrees aren’t enough to capture this. Think of the view from up here more as a sphere of views all around you, each with some different sight to see. A creek there, an interesting rock formation there, it’s incredible. I’ll let the pictures do what talking they can, but you really have to see it for yourself. Eating lunch up there gave me a slightly haughty feeling, one of accomplishment with a large helping of “on top of the world” in the atmosphere. By the way, it is quite up there. Not any huge elevation by the standards of our trip, but high up enough above the valley that you feel almost atop Zeus’ throne, looking down on the little people below. 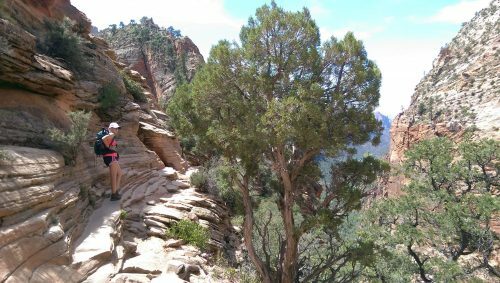 A section of the hike was through a narrow, deep canyon with colorful walls providing some welcome shade. 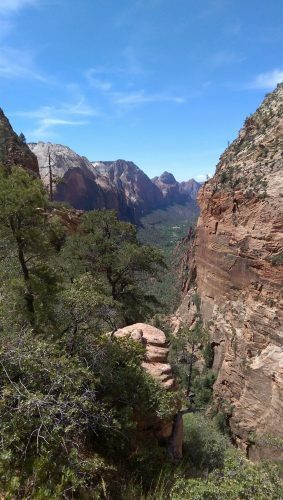 Zion Canyon and the Virgin River from the trail. Stunning. 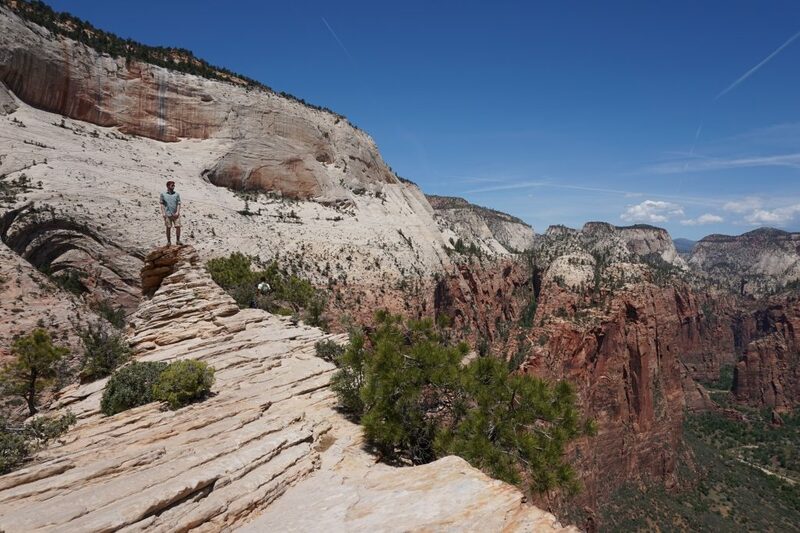 Atop a rock atop Angels Landing, Zion National Park. Another view from the ascent up Walter’s Wiggles. A panoramic of the valley and canyon as seen from about halfway up Walter’s goddamn Wiggles. More of that much needed shade in the narrow canyon trail. The trail began to narrow, and the pace of the hikers began to slow. Stopping to smell the…fear of falling? can’t stop, won’t stop taking pictures. 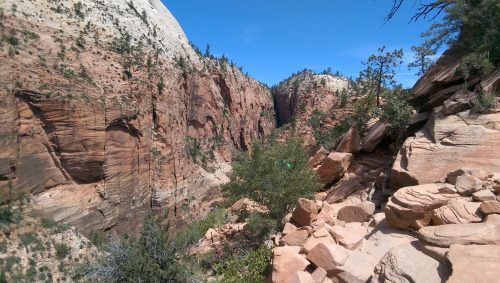 A view of the penultimate ascent to Angels Landing, what a beautiful formation. 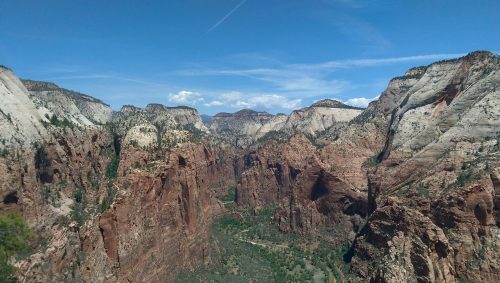 I tried to capture it in panoramic, with Angels Landing in the middle, and the views off either side. I took a bunch more from the top…prepare for more! 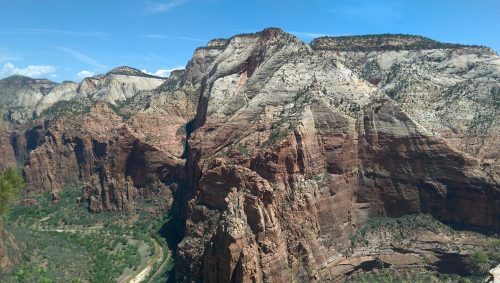 This, is Zion Canyon, as seen from Angels Landing. I think its all been aptly named. Try and find something new! Last one! 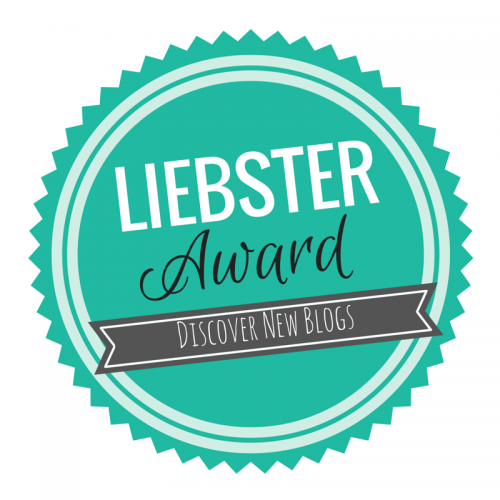 You made it! Okay, my favorite goes last. This section of the hike is where it began to be one-way. It’s also one of my favorite pictures from the whole trip! The hike down, as it always does, took considerably less time than the hike up. However, going down the chained rock cliff portion sends a few more chills down your spine than the way up. 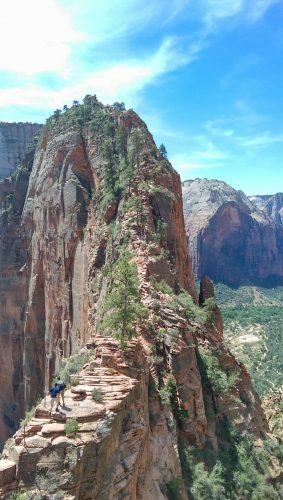 Somehow, stepping down onto a rock that’s juuuust a little too far for you to reach, while you can see the valley floor 1,000 feet below, gives you an uneasy feeling. I suppose that’s because the location of your possible brutal death is constantly in view as you descend. Visions of tumbling climbers constantly flashed through my brain as I climbed down with slightly tired and wavering legs. Once upon terra firma again (at least by Angel’s Landing’s standards), my legs regained some vigor and we continued down. Walter’s Wiggles on the way down were a different kind of challenge. You know that small muscle at the front of your knee, just under the kneecap? It doesn’t get very much use, at least not like this. 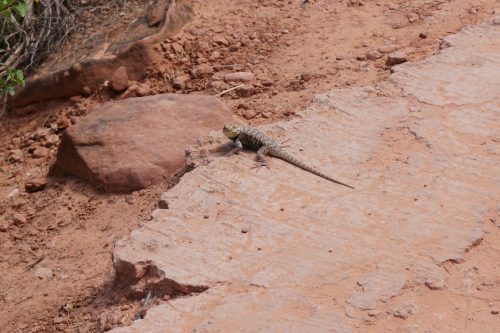 Hiking down a constant and significant slope, that little guy is fighting a big part of the battle against gravity, keeping you front toppling down the trail headfirst into the next pack of hikers to break your fall. From a level perspective, it must look like everyone is constantly leaning back a bit to balance with gravity, and prevent any unwanted forward momentum. Remember “Lean Back” by Terror Squad ft. Fat Joe from way back in 2004? And remember that part of the dance when you actually lean back? It’s like that, but the whoooolllle way down. Turns out this position really stresses that muscle. Thanks, little guy. Anyway, having gotten tired of walking down those damned wiggles, we decided to lightly jog the last mile or so. At the end of the trail, instead of heading straight for the bus stop, we detoured to a short and easy nearby trail that took us to some waterfalls in the area. 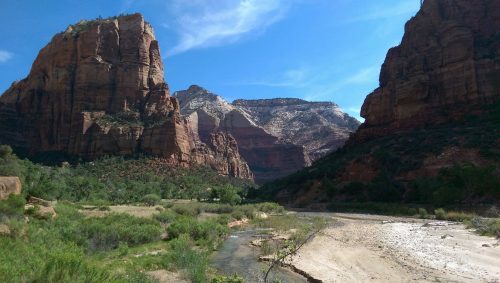 This turned out to be a very good decision, as it turns out, Zion National Park has a free public spa! The whole ordeal worked up quite a healthy sweat, and at the end of our hike, we desperately needed some relief. To our good fortune, “The Grotto” was aptly named. Under the bridge to the trailhead, was access to the sweet, chilly, and oh so refreshing water of the Virgin River. It didn’t take much convincing for either us to take a small dip in. 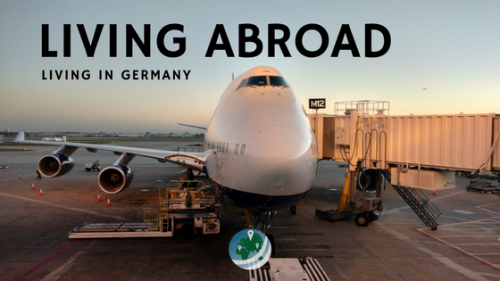 Strip off the backpack, be sure to unpack the cell phones, wallets, and other valuables, and jump right in. Lord almighty, I don’t even believe in you, but thank you for that river. As the river is fairly fresh glacial melt, it was definitely chilly. 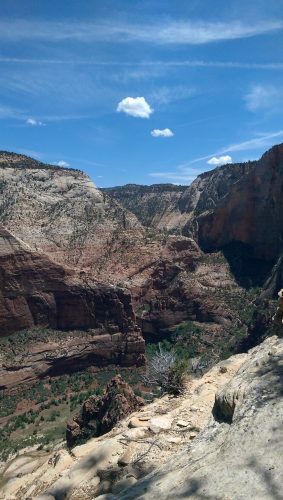 But in the heat of the day and especially after that long and tough hike exposed to a scorching southern-Utah sun, it was quite welcome. Getting to hip-level, and then torso level took some time but was well worth it. A quick dip into the river is only done right if you go all the way in. 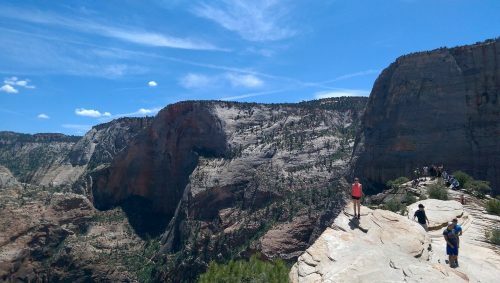 The free nature-bath, courtesy of Zion National Park, was followed up by sunning ourselves on a nearby rock, sea-lion style was just what the doctor ordered. After our river spa treatment, we shuttled it back to the visitor’s center along with a herd of other hikers and park goers. After such a long and hot day, is there anything I crave more than a cold one? No, the answer is no. Maybe a shower, but the river sufficed that. On the way into Zion, we noticed a small brewpub near the entrance. Decision made, brewpubs are amazing. 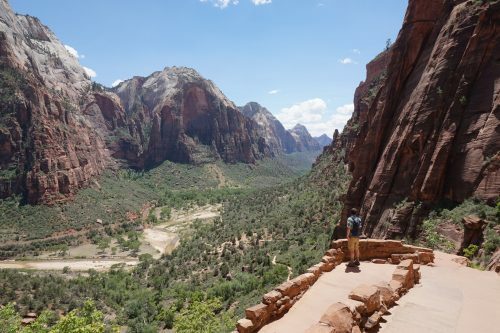 This could make our visit to Zion National Park, even better! We changed into slightly more acceptable clothes and eagerly walked into the Zion Canyon Brewing Company pub. Being a big Blackhawk’s fan, I politely requested that Game 6 of the Western Conference finals be put up on the TV, to which the staff promptly obliged (some NASCAR race was on, and no one was watching, plus the place was strangely pretty empty…for being a brewpub right outside the park!). If there had been more twenty-somethings in the park that day I’m sure the place would have been more crowded, brewpubs seem to be more our scene than the elderly’s, by far the most common age group besides middle-aged parents with little runts running to and fro. Shout out to ZCBC, because their beer was great, and so was their food. Plus the Hawks locked up that series and headed to the finals with a wondrous 6-2 win. GO HAWKS. 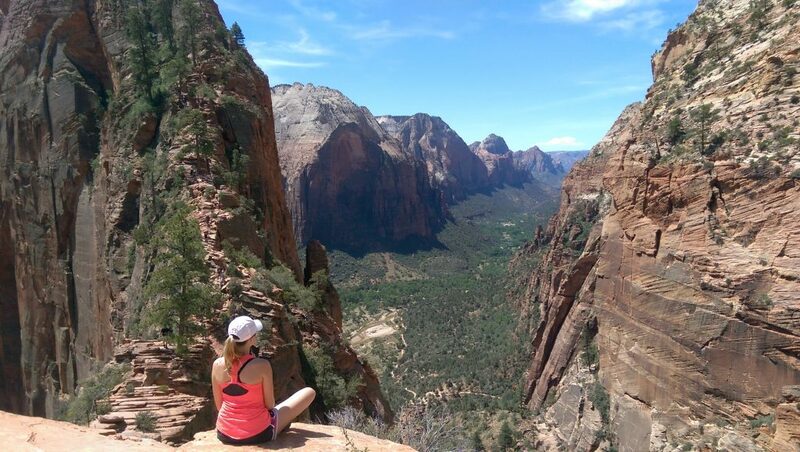 What a great way to end our visit to Zion National Park. The place looks amazing! 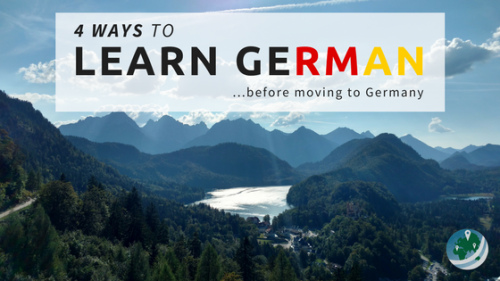 🙂 Thanks for the tips! 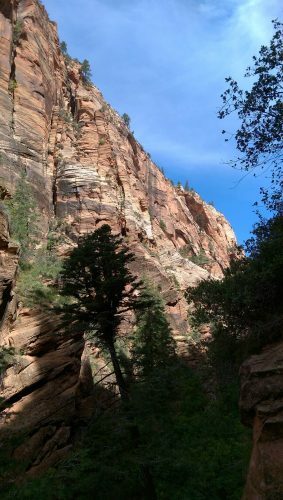 Zion IS amazing! 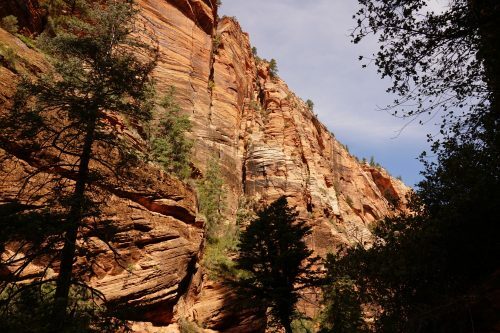 Zion is… so many things. 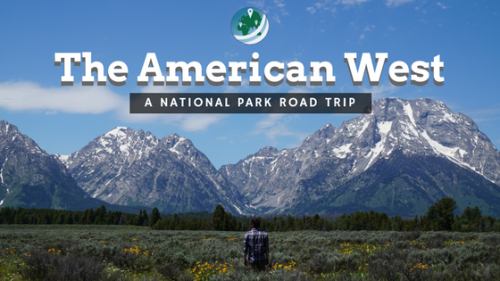 Unfortunately, we only got to do one hike, and even though it was one of the best (at least most popular, and it was pretty awesome) in the park, I feel like we missed out on so much. 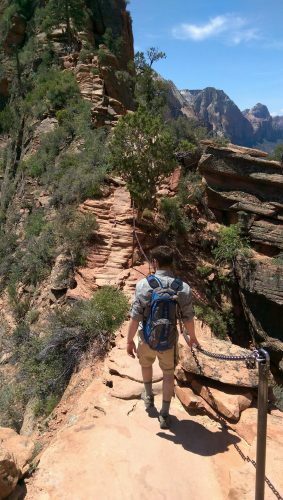 I NEED to do the Narrows hike at some point in my life, whenever I get back to that continent again… and there are probably tons of other hikes in the park that are less known, but still very much worth a visit.